Margaret H. Cuff, of Smith Street, passed away peacefully Thursday, January 31, 2019 at the Philip Hulitar Hospice Care Center, Providence. Born in Providence, she was a daughter of the late John H. and Nora J. (Sweeney) Cuff. Margaret was A graduate of Saint Xavier Academy, she worked as an information operator for Verizon, formerly New England Telephone Company, for forty-three years before retiring in 1984. She was a daily communicant of Saint Augustine Church for many years, and a member of the Telephone Pioneers of America. She leaves a niece, Mary B. Riley and her husband Thomas; two nephews, John F. Byron and his wife Karen and George E. Buck and his wife Melanie; several great nieces and nephews and several great-great nieces and nephews. 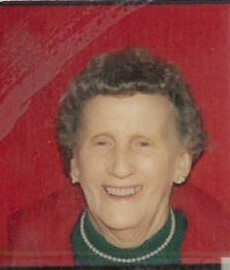 She was the sister of the late Mary F. Buck and Frances C. Byron, aunt of the late Robert J. Byron, and great aunt of the late Christopher T. Riley and Chelesa Buck. The funeral and visitation will be held Monday, from 9:00 am to 10:30 am, in the Russell J. Boyle & Son Funeral Home, 331 Smith Street, Providence. Mass of Christian Burial at 11:00 am in Saint Augustine Church, 639 Mount Pleasant Avenue, Providence. Burial will be in Saint Ann Cemetery, Cranston. In lieu of flowers, donations to The London /Riley RJB Memorial Scholarship Fund, 53 Dante Avenue, Johnston, RI 02919 www.londonriley.org in her memory will be appreciated.